Pictured here is the MOSSAR Color Guard team at the Graveside Dedication for R. Margaret Bellem (Marge) of the Prairie Chapter, NSDAR, at Longview Memorial Gardens in Lee's Summit, Missouri on June 13, 2010. Regent Lois Walden, of the Prarie Chapter, NSDAR, presided over the dedication service. 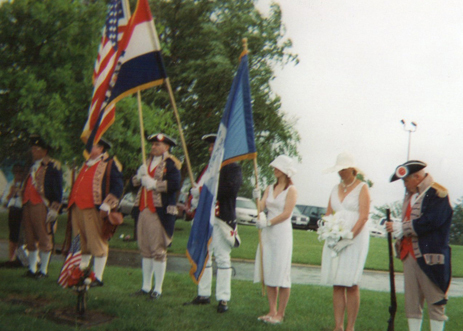 Right Photo (L-R): Major General Robert L. Grover, MOSSAR Color Guard Commander, Captain James Scott, Compatriot Dirk Stapleton, Compatriot Jesse Lybarger, Brynne Krause, Susan Rew, and Compatriot Al Paris.